The Delphi European Cultural Centre and the Institute of Vocal Art and Research under the auspices of the Ministry of Culture, organised a special programme honouring the composer Iannis Xenakis at the Benaki Museum, Athens. 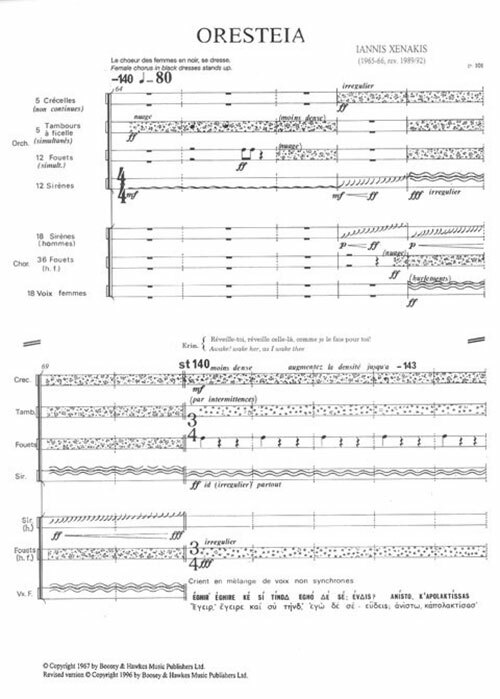 This tribute was centered around the musical / theatrical production of “Oresteia” based on Xenakis’ ideas, with poetry excerpts from the Trilogy by Aeschylus, under the direction of Spyros Sakkas. A group of actors and dancers participated in the production, along with the mixed choir of the ERT – the Hellenic Broadcasting Corporation, the choir of the City of Athens, as well as five children’s choirs. This production took place with the collaboration of the Borusan Istanbul Philharmonic Orchestra, conducted by Görer Aykal. Vassilis Zidianakis designed the costumes and scenography of ’Oresteia’.